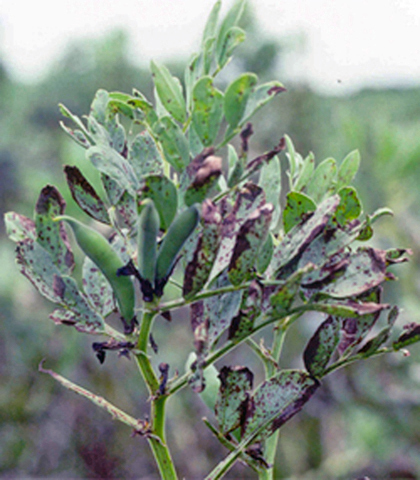 Chocolate spot is a fungal disease that affects broad beans and a wide range of other plants and is seen as dark chocolate-coloured spots on all parts of the plant. Botrytis fabae is the most common, and only affects broad beans. The disease is generally seen in mid-spring on early spring-sown broad beans however,the disease does not affect runner and French beans. Botrytis cinerea causes similar symptoms, and may also cause grey mould to form on a wide range of plants. Small round, red-brown spots appear on all parts of the plant, and in severe cases leaves shrivel and plants can collapse. Under dry conditions the spots are usually much smaller. Avoid cool, damp, overcrowded conditions, and ensure that there is good ventilation in the vicinity of the plants. Destroy and clear away any affected plants or plant debris. There are products on the market based on fish oils that can protect plants, but is of little use if plants are already infected!